I started my travels in 1975 with an interest in ancient civilizations. Then, I found myself also visiting the ruins of a much more recent civilization—our own. It reached its apogee in Peru. I was definitely interested in the Inca, but I found the remnants of Christianity in Peru to be even more interesting. 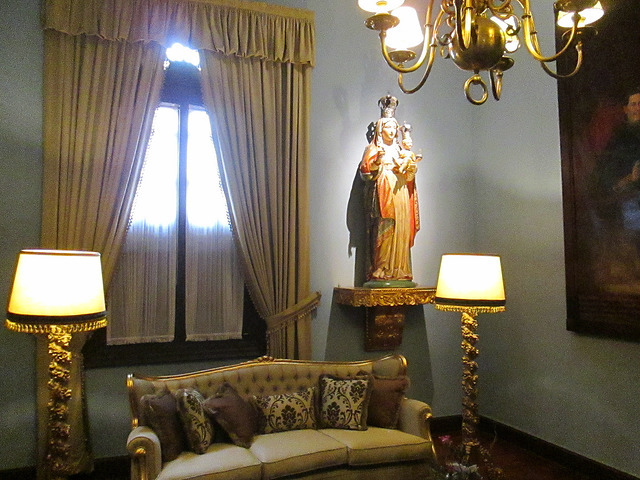 Lima in particular was a treasure house of ecclesiastical art, not only in the cathedral and the main churches, but also in the archbishop’s palace, which is just as interesting. For some reason, I was particularly interested in the depiction of angels in the New World. These were not the hermaphroditic or epicene angels of the mother country, but images of masculine strength that obviously owed something to the images of supernatural beings among the Incas. The angel in the above picture appears to be driving a spear into some unformed material, like clay. There is a look of determination on the angel’s face as well as a feeling of strength. 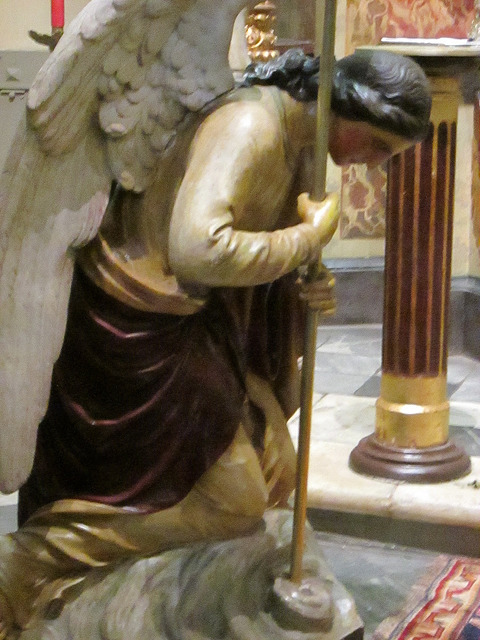 Most of the statuary and art in the churches were actually done by Peruvians, and not transshipped from Europe. 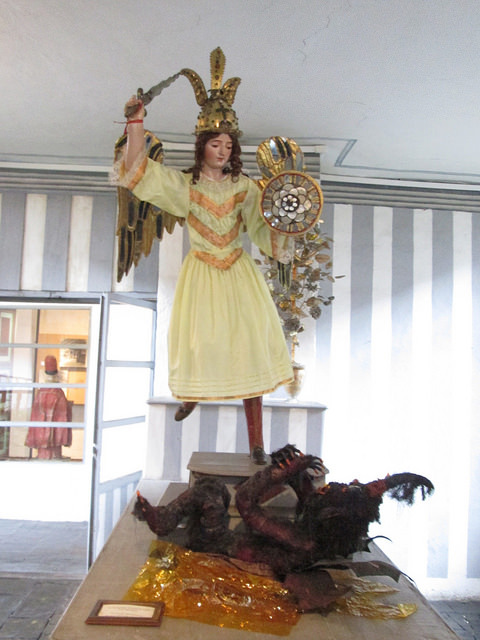 I saw the above statue in the Museo de Las Conceptas in a former convent in Cuenca. He is another one of those militant angels of South America, and one who is in the middle of overcoming a demon. Cuenca has two religious museums. One is the former cathedral on the main square, and the other is in the former convent. If you find yourself visiting Latin America, you will find some interesting bits of our own history as it has been adapted and modified by the converted natives. Perhaps the most extreme example of this is among the highland Mayans of Chiapas. I don’t have any pictures for you, because I was warned against even taking my camera to Chamula. Some European tourists were killed by the Chamulas by taking photos in the church. My brother and I did see the church. There were statues of Christ, the Virgin, and various saints, but they were covered with stalks of corn. In place of pews, there was a large open space, where the Chamulas lie face down on the floor with arms outstretched, surrounded by lit candles. As you can see, going to church is a part of my visits to Latin America. This entry was posted in travel and tagged angels, cathedrals, christianity, cuenca, lima. Bookmark the permalink.